A typical underground “face”. Holes drilled near the center of the face to break are called the BURN CUT. This is a closely spaced group of boreholes drilled parallel to the direction of advance. The cut is the most important part of the blast. The cut is broken and moved out to create a void. The remainder of the holes in the round cannot break effectively unless the cut is completely moved out from the face. This creates the void to allow for expansion and movement from the remaining holes. The boreholes that surround the BURN are sequenced to fire later and break to this newly created opening. Our president?- photo by Pico van Houtryve during interview for The Union newspaper. Our display at the Shasta County Gem Society Show October 18th and 19th 2003. 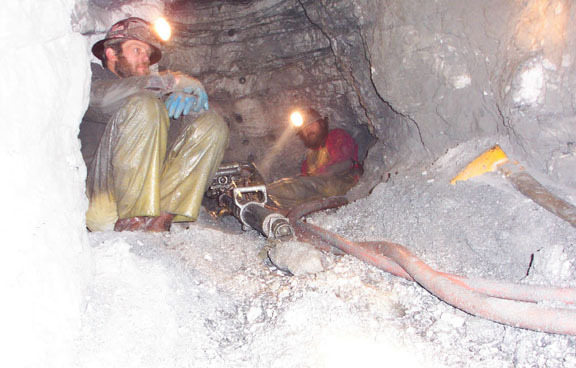 Ian Haley (right) and John Studebaker in front of high-grade sacked in February 2003. It's a $100,000 round....one shift above the Ballroom.